Nothing makes you shine better than a satin dress shirt when shining in your Stacy Adams Shoes is your priority. 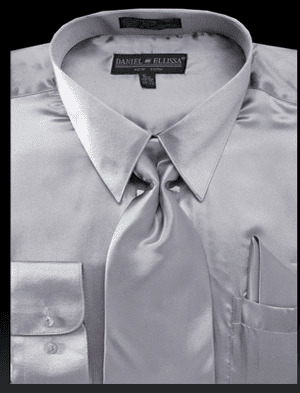 This shiny light gray satin dress shirt by Daniel Ellissa comes as you see it with the matching tie set and is ready to make you the star of the show. Made of shiny satin fabric that goes perfect with both suits and tuxedos if a formal night is on your horizon. This Color is actually lighter in color than our silver color satin dress shirts. Group orders are always welcome. Shopping for shirts for Dance is easy when you realize that a satin shirt is what you need to shine while you Dance. Here is where you'll find the right Tuxedo. You can find some very nice looking Cheap Suits here.